The "Get to Know" series of books by Nancy I. Sanders are a collection of Bible Hero (Jesus, Mary, King David, & Apostle Paul) biographies for kids. They explore the life and character of these biblical figures through scriptures, timelines, and pictures. 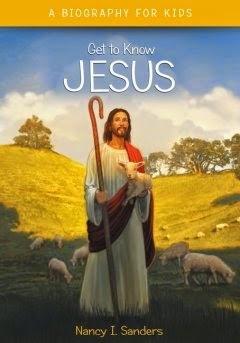 I was sent the Get to Know JESUS book free to review. This is the perfect book report material for a child. Right away I was drawn in by the colorful illustrations, photographs, and text bubbles. It starts with the history before Jesus was born and his birth, then goes through his life, death, resurrection, and the future. A neat feature are the color coded icons throughout the book that relay important facts and information. There is a word bank that explains the definition of vocabulary words used throughout the book and Eyewitness Accounts from people who saw what happened and then told about it. I also love that it gives scriptures for the children to look up to connect it with what was already shared. I would highly recommend this book to any elementary or middle school child. The life of Jesus is displayed in a really fun, engaging way that will draw any child or adult in.